DESCRIPTION Coiled body with slab and modelled details. Blue and cream mottled glazes over marble white. ARTIST'S STATEMENT I specialise in making birds, but the cats are such a pleasure to create and I can experiment in some unusual colour combinations. The monochrome black and white cats are very striking as are the chocolate brown and turquoise. 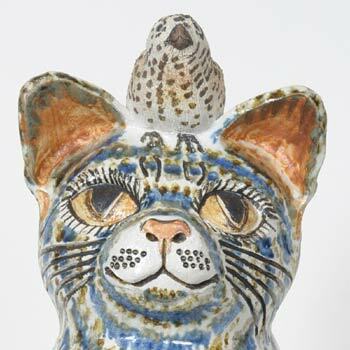 The blue cats came about by a happy accident, when a pale ash glaze I was working on came out sky blue. 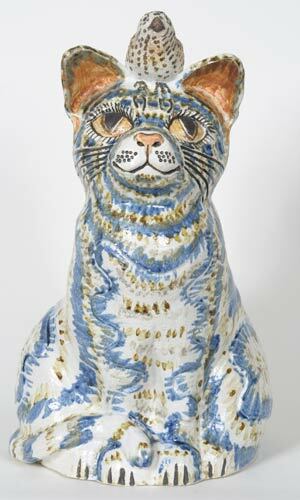 The galleries I supply with the cats, loved the blue so much, that they are now a popular colour in the range. The first one hundred cats I have carved have a wren on top of their heads and the new two hundred series feature a robin.